What is the better guaranteed income product for a retiree age 70 wanting guaranteed lifetime income at age 80; Index annuity or QLAC? Most popular choice has been the index annuity with almost $50 billion of deposits in 2015. Allianz Life is the #1 carrier in indexed annuities, with a market share around 25 percent. American Equity Companies held on as the #2 carrier in the market; Security Benefit Life, Great American Insurance Group, and Athene USA followed-up in sales, rounding-out the top five. Allianz Life’s Allianz 222 Annuity was the #1 selling indexed annuity for the second consecutive quarter in 2015. These index annuities have an optional GLWB (Guarantee Lifetime Withdrawal Benefit) income rider usually for up to 10 years where income is guaranteed for an annually fee above 1%. Fewer and fewer index annuities have income riders that guarantee an income payment for life as the current low interest rate environment is to blame. 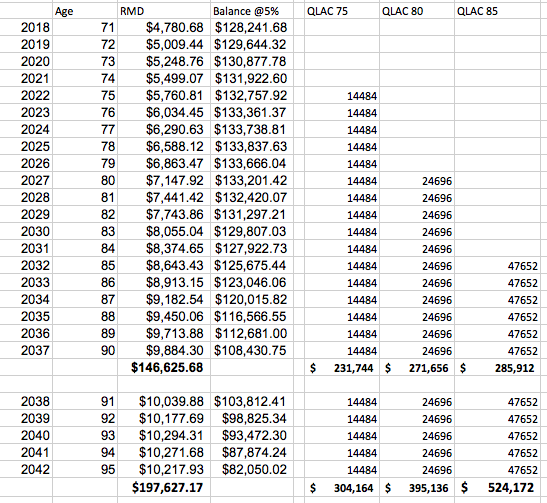 The product that got the “blessing” from the Treasury Department in 2014 is the longevity annuity also know as a QLAC (Qualifying Longevity Annuity Contract). This federally approved “blessing” allowed the RMD from IRA deposits to defer required minimum distributions until age 85. Usually a one-time deposit for a guarantee lifetime income at a future date chosen by the policy holder. QLAC options include inflation income adjustments of 1% -4% along with CPI-U, death benefits of deposit and joint annuitant for income.